Let me start off by saying don’t read further if you are easily icked-out. Oscar followers know a few things about Oscar like the fact that he lived outside on his own for at least 3 of his 4 winters. I thought that maybe he had some frostbite on his back toes because they had some dark patches that didn’t look natural. His ears have tattered edges from confirmed frostbite so this supported my hypothesis. I promise you that this hasn’t seemed to bother Oscar at all. 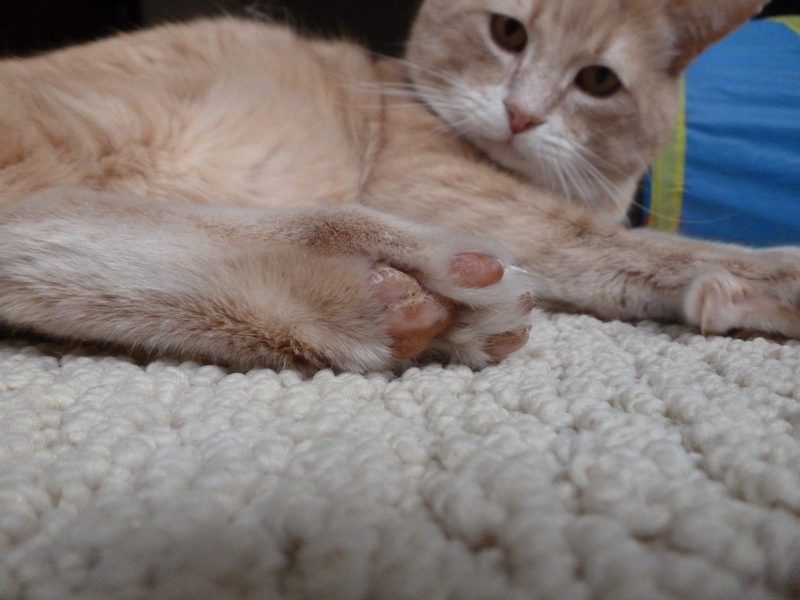 At Oscar’s recent vet-visit, the vet thought that maybe Oscar’s crusty toes were part of an allergy. I went through every photo I’d taken of Oscar’s feet and put them in chronological order to try to gain better perspective. 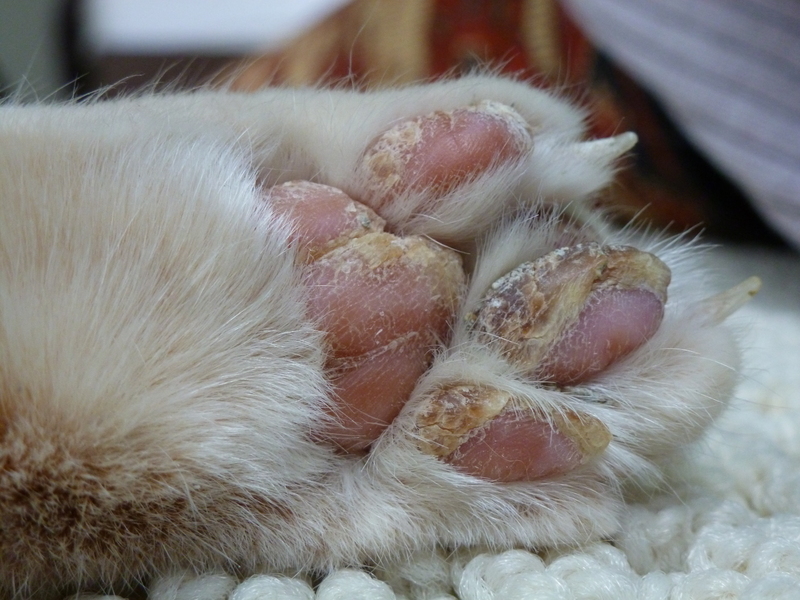 The photos below are of the back paw pads – the worst. There are some strange things about this. This was taken couple of weeks after coming indoors. I’d noticed that he had unnatural dark splotches on his toes soon after he came in and thought I’d just remain aware of this. He had Revolution, vaccines, and anesthetic in the first days inside – so this could be a reaction to these or a preexisting issue. I don’t remember noticing his toes prior to trapping him. Not pretty. I began Omega3 oils, increased humidity in his room, and used an olive-oil balm and bag balm on his feet. I began with bag balm but got nervous about the safety to any regular use. Oscars feet began getting really dry and gross – this is about 2 months indoors. I thought it was callous or early-stage frostbite combined with the fact that indoor air is drier especially in winter. I hadn’t compared this to the photo above. His front paws were dry, but his back paws were horrible. I increased the humidity in his room, gave him a bit more oil in his diet, and put a thin layer bag balm on the tile beside his food bowl (aka self application). After a few applications I changed to a natural lanolin/olive oil balm for safety: in case of some ingestion. At no time did his feet split or bleed (no visible lesions either) and there was no licking of his feet – all good signs. After feeding him a little omega 3 fish oil, vitamin E for a week, and putting the natural olive oil/ lanolin based balm on the floor beside his food, the dryness seemed to improve. (Fish oils, pure olive and coconut oil are safe for cats – not all human oils are. Some Omega 3 oil is grain based and which aggravates allergies) The dry crusty bits began to come off. These days Oscar’s paw pads look much more normal – he’s been inside for 5 months. There are one or two little scabs remaining. Those dark patches are replaced by pink. As the vet pointed out, one paw seemed to have a fissure that has healed. He hasn’t had any open cuts or fissures while he’s been inside. It must be old – though it was hard to see under the dead skin. Yesterday. There are a few scabs remaining and most dark patches are replaced by pink. Looks like there are some old fissures that have healed. Ever seen anything like this? What do you think it was? Allergy? Early stages of frostbite? Poison or toxicity? Chemical burn? Just very bad dry skin? Why was it much worse on the back paws? I can’t help here, Harvey never had pads like this. Maybe fungal in origin? But I’m stabbing in the dark. How is the rest of his itching? A littler better. The vet did not agree to try a broad-spectrum antibiotic shot for any other infection which might be the source. I was frustrated at that (because I wanted to eliminate the likely, simple answers first). The more I think about it, the more inclined I am to say that it’s NOT frostbite. I say so because geographically, we live in the same area. Harvey was outside for at least 3 years and his toes look normal by comparison to Oscars. 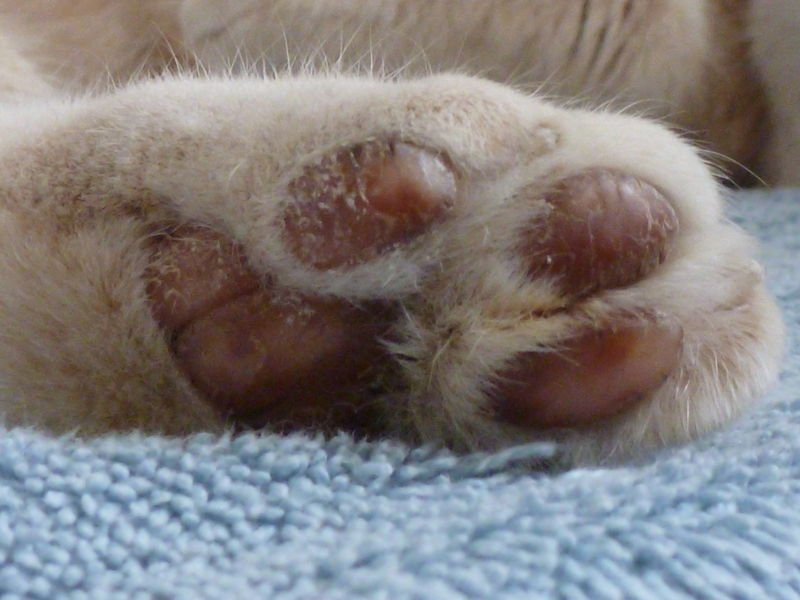 Have you tried looking for images of feline paws that have been frostbitten? Looking at this again, I’m more convinced than ever that it was likely frostbite. The one thing throwing me is the timing – so is it frostbite from the previous winter? If it’s toxicity it could be anti-freeze (which is deadly, but tastes good to cats). Everything depends on where he had shelter during the cold. He definitely had frostbite on his ears in winter – I witnessed it myself. So he’s had frostbite for 1-2 winters for sure. Definitely not frost bite!! My kitty who lives in balmy Austin tx has this too. The vet said it could indicate he’s not getting enough of certain vitamins, or that he has an autoimmune disease, testing him for it involves anesthesia, punching out a sample of his paw, and sending it off for a $200 analysis. Were you ever able to find out what the problem was? 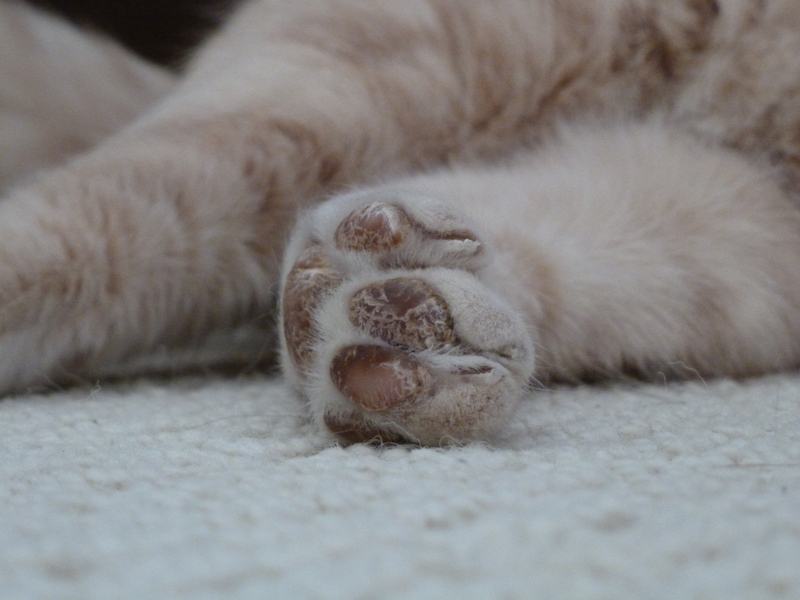 I have an indoor cat who suddenly has paws similar to this. 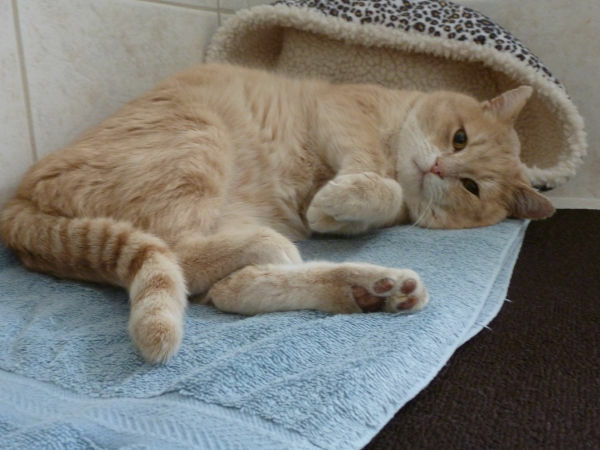 I didn’t pursue the cause… it would have cost a great deal of cash for vet bills. Instead I followed the my own regimen (noted in this blog about Oscar) and the problem resolved itself. I would lean towards having been outside in the deep cold for long – because my current foster also has very dry pads (similar – but they haven’t started to peel/slough off yet) after spending an icy winter outside. Ok first i have to point out crazy scary coincident, my cat looks exactly like your an is also named Oscar and also has what looks to be the same problem. Spooky, no? For my Oscar its only two of his pads, one of each back foot. I can say with certainty that it isn’t from toxicity of any kind because there is no redness, or puss on the pads and with poison you’d see other symptoms and relief as the days go by and he’s not exposed to it anymore. My Oscar has pretty dry skin and a coarser coat. He has never been outside to be able to contract frost bite, and again if it was frost bite it would have happened sooner and would have gone away and not gotten worse. I really think that it’s something to do with the vitamins and the very dry coarse hair. I’m wondering maybe if it isn’t linked to the lack of omega3. I say this because i remember my friends dog had very coarse hair and the vet said to add more Omega3 to the diet. That is what i am going to try with my Oscar and see if it helps, for me I’m not too worried because it doesn’t seem to bother him one bit, he lets be examine his pads easily, there is no redness nothing inflamed or infected. I’ll try the Omega 3 and keep a close eye on his other pads. Omega 3’s a great and I think they helped Oscar. I gave him some as part of the change to the ancestral diet (the vet felt that it could be food allergy as well since some cats are sensitive to grains and so many cat foods have grain in them). Ask your vet about the dosage based on weight of Omega3 (since too much can damage liver or kidneys)- and use the non-grain type. Fingers crossed for your Oscar! I just adopted a 14 y/o cat who has similar issues with his pads. I too am taking the approach of adding salmon oil to his diet and also dabbing a bit of coconut oil on each pad. I have read that coconut oil has other benefits for cats as well but he seems to just leave it on and not try to lick it off. We have a wellness visit at the vet today and I am certainly going to ask him about it but hoping that holistic types of remedies will work! I have a cat with this same Thing! She also lived outdoors during the first part of her life. But we are In Texas so no frostbite. Also do not think it’s related to get coat, she is very soft. Buttttt her pads are getting worse. I thought maybe the litter? Could absolutely be an allergic reaction or a ‘dermatitis’ reaction to litter. Change the litter type and give it a month to see if it changes or goes away? I am in Arizona and have a cat the same color as Oscar. Once ever 1-3 months, the pads on 1 on more feet start to get hard and thick. After about a week, the entire surface falls off leaving a clean pad exposed. Sometimes I will help a bit and finish pulling it off as long as he doesn’t protest. It appears to be eczema, likely autoimmune rather than exposure to something in the house. I have changed litters and food several times with no improvement, and there no chemicals or plants he could be playing in. He doesn’t seem to notice his condition so I have never persued it further. His orange roommate has never produced any symptoms.